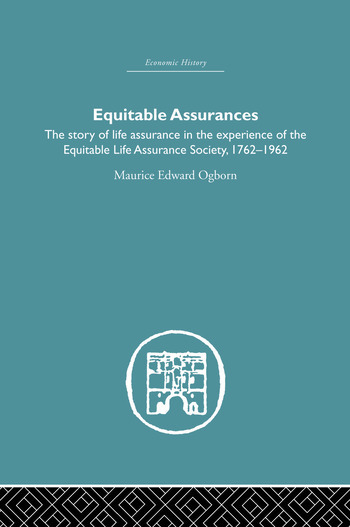 The original establishment of life assurance upon a sound basis was largely the achievement of The Society for Equitable Assurances on Lives and Survivorships (now known as The Equitable Life Assurance Society and still affectionately called the 'Old Equitable'), and of the men who served her. Old Equitable was the first life assurance society to grant long-term contracts for either a stated period or the whole of life, with premiums calculated according to age and type of assurance. Published in 1962 to mark this Society's bicentenary, this book charts its long history in a way that will interest not only those actually engaged in the assurance business, but any intelligent policy holder to whom perhaps the mechanics of life assurance is still a mystery. This book traces the development of life assurance from untried theory into established practice, through the interplay of ideas of many individuals. Their activities, ranging far beyond the quiet walls of a life office, are part of the stuff of history. It tells the story of how James Dodson's vision of mutual life assurance became realized in the pioneer 'experiment' of the Equitable.